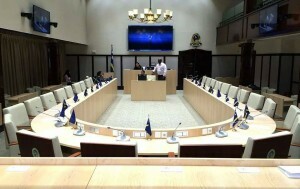 WILLEMSTAD – Coalition party PAIS introduced a bill proposal in which the legal liability of government ministers is arranged. It is the first time that an arrangement is made to address ministers who carry out financial transactions without official authorization. Parliament had passed a motion calling for such a bill more than eighteen months ago. The motion was a result of the conclusion of an internal government audit indicating that irregularities had occurred in the period of 2010 to 2012. The PAIS proposal also includes regulations to impede that ministers use land resources to create private entities and later on participate in them. Thus, a government can now evade the budget law of parliament. The bill will be submitted next week to Parliament.